It’s come up before of course, but there’s a lot of chemistry in cooking. I do like tinkering with recipes: all that lovely weighing things on digital scales, measuring liquids, working out ratios and tweaking the exact sequence of steps – what more could a chemist want? I spent ages working on my chocolate brownie recipe when I should have been writing up my PhD thesis (it does produce excellent chocolate brownies, so I maintain it was a entirely valid use of my time). Last week fate transpired to drop more than one reference to ‘biscuits’ in my lap. Now, these were American sources, so I was aware that they weren’t talking about what we call biscuits (and Americans call cookies), not least because in one of them there was talk of making a ‘biscuit sandwich’ that included sausage. Now, I like a chocolate digestive as much as the next person, but I wouldn’t slap a chunk of grilled pork product in between two of them and call it breakfast. So I decided to try and find a recipe. And, after a bit of faffing around converting Fahrenheit to Celsius and cups to grams (honestly, I do understand the principle of cups and baking by ratio, but is it really easier to measure out a cup of butter than just use scales?) I finally came up with a workable recipe. Turns out American biscuits are basically sugar-less scones. Who knew. This type of reaction is called thermal decomposition, because the heat is causing the sodium hydrogen carbonate (NaHCO3) to break apart. The carbon dioxide (CO2) is a gas and produces lots of lovely bubbles that make your finished product nice and light. Water (H2O) is also a product, which helps to keep everything nice and moist. This clever bit of cookery chemistry starts to happen slowly at 50 oC, but once you get over 200 oC (a more typical baking temperature) it’s pretty fast. So much so that you can bake your biscuits for just 12 minutes or so and they’ll be perfectly risen. Contrary to common belief, there’s no need to add some kind of acid to the mixture (buttermilk is often mentioned). Acids do react with carbonates to produce carbon dioxide, but there’s no need – heat will do the job for you. Heat the oven to 230 oC. It needs to be nice and hot, so turn it on in good time. Measure the dry ingredients in a large bowl and mix them. Using clean, cold hands rub the butter into the dry ingredients until the mixture resembles fine breadcrumbs and there are no lumps of butter. Pour in the milk and mix with the flat of a knife until the dough comes together. Take the dough out of the bowl and place it on a lightly floured surface. Knead it gently a few times until it forms an even ball and has an elastic, ever so slightly sticky, texture. Press into a rough oblong, about 2 cm thick. Cut the dough into six roughly equal pieces (you can use cookie cutters, but again, why create unnecessary washing up). Place these on a greased baking tray. Bake for about 12 minutes, until the biscuits are golden brown (the colour is, of course, courtesy of another bit of chemistry: the Maillard reaction). Transfer them to a rack to cool, but no need to leave them too long – they’re best eaten warm! Split the biscuits in half and fill them with anything you like, savoury or sweet. They’re delicious served plain with lashings of butter. 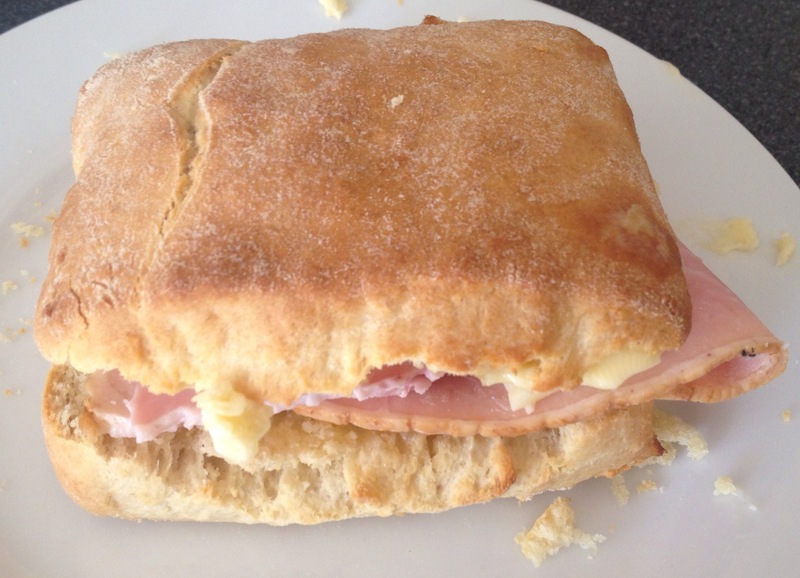 As a more substantial lunchtime snack, try cheese and ham. Lemon curd has also proved a favourite. If you have leftovers they will keep until the next day if wrapped up, and are especially nice toasted and buttered. And there you are, a metric version of the classic American biscuit recipe, with a bit of chemistry thrown in. I think this might be a first. Heston eat your heart out. This entry was posted in Everyday chemistry, Food and tagged American biscuits, baking, baking soda, biscuits, cooking, savoury, sodium hydrogen carbonate, thermal decomposition by katlday. Bookmark the permalink. As a Brit now living in America, I still find the notion of measuring butter in cups total nonsense. Though packets of butter are 1 lb, further divided into 1/4 lb sticks, which are further divided into 8. So I can pretty easily measure 1/32 lb of butter. But even the ingredients for which a cup makes at least some sense, like flour, are inaccurate to say the least. How much flour is in a cup? Well it depends how well you scoop it out, how densely packed it is. 100 g of flour is 100 g of flour, but 1 cup? Well it has error bars on it. Perhaps one day they will go metric? (He said knowing it will not happen any time soon if ever). Well in fairness, we Brits aren’t exactly consistent with the metric system. We can’t seem to let go of pints for milk and beer, but wine and fizzy drinks are fine in millilitres. We measure ourselves in stone, but pretty much everything else that sort of size in kg. Distances in miles, fuel consumption in ‘miles per gallon’, yet fuel in litres. Fahrenheit in the summer when it’s hot, Celsius in the winter when it’s cold… at least Americans are consistently wedded to ‘imperial’ (hehe) measures. 1. Preheat oven to 260 C.
2. Put the flour into a bowl and cut the very cold butter into cubes and toss in the flour. Using a pastry cutter or two knives, cut butter into flour until it is crumbly. 3. Add buttermilk and use a fork to mix very lightly. Dough will be very shaggy. 4. Put a bit of additional flour on the countertop and scoop dough out. Sprinkle a small amount of flour over the top and gently push together to form a rectangle. Do not overhandle the dough. 5. Take the short sides of the rectangle and fold them in toward the middle, turn the dough, gently press down into a rectangle again and repeat. Repeat this folding once more and pat into desired thickness, usually about an inch. This folding creates flaky layers in the biscuits. 6. Using a biscuit cutter or the rim of a small juice glass, cut out into rounds, taking care not to twist the cutter and gently gather scraps for the last biscuits. 7. Put biscuits on baking pan with sides touching and cook at 260 C for 10 to 12 minutes. This recipe should make for much flakier biscuits. My grandma would also make chocolate gravy to go on top. This is one of my favorite childhood meals. I’d listen to Ben when it comes to the buttermilk; it adds a depth of flavour. Southerners know a thing or two about biscuits. If you feel really adventurous, try the biscuits with a sausage gravy-a specialty where I did my undergrad at Oklahoma and almost worth the heart disease that inevitably will belatedly accompany such a rich and salty breakfast. Also, a note on nomenclature, which I find interesting. In America a biscuit is, as you described, an unsweetened scone. An American “scone” is like an English scone, but almost always triangular, somewhat sweeter and with tasty fruit, nuts or chocolate pieces mixed into the dough. A little bit of heaven, scones are most often consumed with coffee, which is why, perhaps, the word “scone” means something else entirely in the Mormon corridor (where coffee consumption is lower) from southern Idaho through Utah and parts of Nevada and Arizona. In this area a scone is, thanks to the prevalence of a confused restaurant chain, a triangular, deep fried yeasted dough, like a sopapilla or a beignet. True enough that buttermilk is not required. Also worth mentioning is that the folding helps incorporate the flakey layers characteristic of a southern style biscuit. 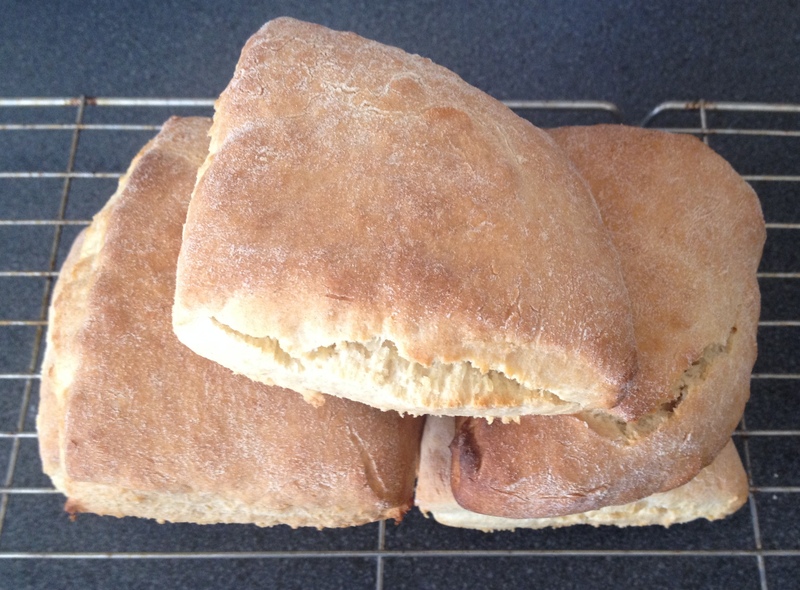 Followed the recipe exactly, biscuits were inedible. All I taste is baking soda. Really horribly inedible baking soda flavor. I showed my grandma the recipe over Skype (she’s born n raised in Florida, USA) and she started howling with laughter. Your recipe says baking soda but the chemical name you gave seems to be what they call baking powder. At least where I live (Tokyo). Because our baking soda is sodium bicarbonate. Sure enough, I checked her recipe and it’s baking powder (not sodium bicarbonate baking soda) that she uses in hers. Kicking myself that I didn’t double check the chemical names of soda/powder in my country against what your recipe says.